Remember the endless spiced chickens? This morning I pulled both out of the deep freeze and made a soup with lentils. Sauteed onions in olive oil, added crushed garlic, some paprika and cumin, a can of chopped tomatoes, the broth, and two cups of mixed lentils (little green Puy and split red). Bay leaf. Boiled it. Then at the end, dropped in the frozen spiced chicken leftovers and plenty of salt. Let that heat through and cook for a bit. It's heaven. Especially to treat a bad head cold. One of the mothers at my kindergartener's school is a Yemeni from Sana' - I ate a version of this at her house. Yum, yum. Yes, I have an inner chef. I also have an inner lawyer. Around that time I discovered my inner lawyer. I was working for lawyers as a legal secretary, and painfully aware of how I'd fallen off the professional path long before. The people I worked for could have been my classmates and peers in high school and college, but they were the conscientious, driven, competent ones. I was smart enough, but flaky, alternative, a bohemian slacker with weird clothes and unruly hair. I made lots of careless errors. I could type very fast and churn out documents in record time but I drove the lawyers nuts. Then I discovered that I usually knew when I was making a mistake, overlooking something, not doing something right. Normally I would just slam through, ignoring the little inner twitch. I learned to listen to my inner lawyer, look at the paragraph or word or filled-in form that bothered me. The lawyers thought this new development, my inner lawyer, was pretty weird, since I liked to tell them all about it. But my error rate dropped off and I got to be a demonically productive secretary. They had to hire two people to replace me when I left that last position. In the mid-1990s I worked in a culinary school. I hung out with the chef instructors at lunch and after work, learned how they think and operate. I am no chef - too uncoordinated to be in the hot kitchen, too sloppy to do pastry or garde-manger. Really I have small-motor issues, I'm sure of it. But I did pick up some attitudes. For one thing I'm very paranoid about cross-contamination. For another thing, I feel guilty whenever I throw out bones, pan juices or cooking liquids. They could make stock, you know. I'm working on having an inner Micheline Marcom - literary mentor and extraordinary writer. She's younger than I am but quite an inspiration. Every aspiring writer needs an introjected genius literary artist. I know I bitched about this six chicken roast melee, but I am still obsessed on it. Am I procrastinating on my novel? maybe. There were lots of leftovers. Six chickens is too many for a buffet party, even one with fifty guests. There was plenty of other food, and I arrived late, so only about half the chicken got eaten. I have leftovers, including the carcasses and wings and such. I also saved the pan juices, a good four cups worth of spicy chicken essence. When reheating leftover chicken, I boil it for a good five minutes in a combination of water and pan juices, to make sure everything is totally cooked, and to kill any bugs that might have decided to grow whilst the chicken sat on the buffet table at the party. So far no side effects. The leftovers have filled out two suppers for us quite nicely. Last night I was faced with about four carcasses - backs and breast bones with tiny bits of meat and gelee clinging to them. My inner chef could not face just throwing that stuff out. I put the carcasses in the pressure cooker with a chopped onion, two ribs of chopped celery, and water; cooked it under pressure for 30 minutes and let sit for an hour (pressure cooker method for chicken stock). This yielded a spicy chicken broth which I strained and put in the fridge. I have a new friend from my son's school who is Yemeni; she's always feeding us lovely suppers when we visit after school. From her I got the idea to cook lentils in the broth; then add the spiced chicken leftovers in the freezer and cook thoroughly. I may freeze the broth and do this when I have the Yemeni family over for lunch at Christmas time. I've liked Mark Bittman's cookbooks for years, felt that his style and his voice reflect the way I like to cook. If you read me on the usenet, you know I'm always talking about him. He has a New York Times column I enjoy (whose recipes feed into some of his books). Lately I've discovered Mark Bittman on video at the Times. (update - see if this link gets you there - they don't make it easy) It's hugely entertaining. He is such a character, with the amused, humorous attitude of the lifelong New Yorker. He's a big ham and he plays well with other New York hams - his segment with the baker Jim Leahy was completely endearing. I haven't totally figured out where you go to find his video archive links. When the video goes by on the main page, I click on it, and then his past videos come up for browsing. I just looked at his piece from nine months ago on chicken with green olives. The Times thought they would be clever and edit the recipe out, so you'd have to buy it from the archive. Hah! I used my graduate student privileges at the library online to find it in Lexis/Nexis. But I'm not going to reprint it because the Times lawyers are very clever and very dogged and they'll come after me. Note that his recipes are not foolproof. I don't think he tests them enough - at least not the ones in "How to Cook Everything." Some work well, some fall flat. Other people have complained of this. You have to be wary, and if you think "that doesn't look like it will turn out right," trust your instincts. My roast chicken melee last night was a total hassle, but the chicken that was cooked through tasted great. Several people came up to me raving about it and asking for the recipe. It's marinated in a lemon-garlic-spice mixture, then roasted with more of the spice mixture sprinkled on. The combination of cinnamon, cloves, cumin and paprika just drives you crazy with the delicious smell as it's cooking. Here is my adaptation with chicken parts. Originally appeared in Gourmet magazine, May 1995. With a mortar and pestle or in an electric spice grinder grind cuminseed, cinnamon stick pieces, and cloves and in a small bowl mix with paprika, cayenne, and salt to taste. In a non-aluminum container large enough to hold chickens stir together garlic paste, zest, lemon juice, oil, and 2 tablespoons spice mixture (reserving remainder) to make marinade. Rinse chicken parts and pat dry with paper towels. Put chicken in container and rub with marinade to coat. 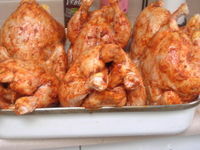 Marinate chicken, covered and chilled, at least 2 hours or overnight. Put half of chicken in each of 2 large roasting pans. Brush chicken with any marinade left in container and season chickens with salt. Arrange skin sides up. Sprinkle with reserved spice mixture. Roast chicken in upper and lower thirds of oven 20 minutes. In a small saucepan melt butter. Brush chicken with butter and sprinkle with chopped parsley. Switch pans between upper and lower racks and roast chickens 20 to 30 minutes more, or until a meat thermometer inserted in fleshy part of a thigh register 175°F. and juices run clear when thigh is pierced with a skewer. Serve chicken warm or at room temperature and garnish with parsley sprigs. I've been threatening to try a recipe in which you roast six chickens at once in a giant roasting pan. Now the chickens are prepped and marinating. Because I combined the internet recipe with my own favorite spiced chicken recipe (adapted from Gourmet/Epicurious), the hassle factor was higher than it would have been. Rubbing those chickens with the gloppy marinade was icky. The flavor is worth it, I think. My roaster must be extra large, because the chickens don't fit in snugly, they have plenty of room to loll around. However that also means they have plenty more room to cook - if they were wedged in on top of each other, they wouldn't cook evenly. Tomorrow I'll debrief here on how it went. See flickr for more pictures of the process. And afterward I cleaned and sanitized my kitchen counters and sink. The place reeks of chlorine but boy are we clean at our house. Tonight after I get the roasted chickens out of the oven, I'll have to cut them up, then sanitize all the surfaces again. Will I even want to go to a party after all that? Update. It's not going well. The chickens were apparently just not defrosted well enough (I'd bought them early in the week, started defrosting them in the fridge on Thursday, trying so hard to follow all the safety recommendations. !#@$@). They've been in over two hours and I'm not sure they're done yet. And we're late. P***. This really is a hassle. The recipe is NOT as easy as the chef makes it sound. Update next day. NEVER AGAIN. I will not detail here the enormous hassle and trouble of getting the damn chickens to cook. And some parts were still underdone, curses. My mother-in-law was enormously helpful during the whole process, including hacking up the chickens with me at the end. We were an hour late to the party. The original spiced chicken recipe as I've adapted it from Gourmet uses pre-cut chicken parts; it can be made with about ten pounds of chicken, to serve twelve supposedly, but at a potluck it's plenty of chicken. My mother-in-law sensibly suggests that I just use the original recipe. Never again will I attempt to roast six chickens at once. It is simply not worth the trouble to me. You probably read the main blog, but in case you don't, check out my post on street food during Lebanon's big demonstrations. This darling friend of mine has been giving a Hanukkah party every year for the last decade or more, and I've been going to them with my husband since 1996. Last year I brought a roast chicken, purchased. I was too stressed out to think of cooking anything. We had a terrific time at her party, but there wasn't enough protein. She sent her husband out half way through to buy more roast chickens. The next day when I called to tell her how much I enjoyed myself - the latkes were delicious, the company grand, the house looked amazing - I also said - write down in your party notebook for next year that Leila will roast six chickens. I'd been browsing this quantity cooking website. Don't ask me why. My father just died. I'm in grad school. I am not going to throw a party any time soon. But I just wanted to try out this chicken idea. It's called a Roast Chicken Melee. Last week my friend, who claims not to be organized but does keep a party notebook she can find from one year to the next, called me to see what I might bring on Saturday night. Sure I'll cook the chickens, I said. I haven't forgotten. One day I'm going to feel like roasting chicken for a crowd, so I'll try this out on your party, for practice. The trick: roast six chickens at once in a large roasting pan. Up-end the chickens so their legs are in the air; they will supposedly fit, and if you buy chickens within a few ounces of each other, they'll all cook at the same time, in about 70 minutes. My plan is to use the spices from this recipe to marinate and then roast the half dozen chickens. I own a plebeian but sturdy enamel roasting pan, very large. If I can get a proper camera battery I will photograph this process and upload the pictures. If you don't read the foodie blogs, then you may not know what a stir that no-knead bread caused. The blogosphere, usenet and the rest of the Internet went wild. There were reports of a run on instant yeast in Manhattan. People all over the world began baking the bread and reporting on-line: see here, here, here and here. Many uploaded pictures of their loaves to Flickr. The article was "most e-mailed" for a week, and still seems to have legs. Folks are adapting the recipe to make it whole wheat, or olive, or sourdough, and so on. Peter Reinhart, the prolific baker, teacher and cookbook author, says he may have to add a chapter to the book he's finishing just to accommodate this new technique. One commenter thinks it's a sign of the end of the Atkins low-carb era. Bread is back! I don't do fast food, and rarely bother with frozen or convenience foods. Sometimes I'll cook frozen vegetables for the kids, if I haven't been shopping, and sometimes I'll throw a frozen pizza in the oven when the babysitter is going to give them supper. (She can't handle anything else). Hence I have to come up with strategies for nights when I have very little time or energy for cooking, but want to put a decent meal on the table. It's complicated by the fact that hubbie really can't eat just pasta for dinner. He's not low carb 100% but he needs an animal protein and a substantial amount of veg in his meal. The days when I could throw some broccoli florets into the pasta water and call it a one-dish supper are long gone. Tonight I really, really didn't want to take too much trouble over dinner, but it still came out well: chicken legs baked in the oven with olive oil, salt & pepper, and many cloves of unpeeled garlic; leftover winter squash reheated; green salad; raw carrots and cucumber slices for the children; artisan Italian bread from the market; and a can of cranberry sauce. Yes, cranberry sauce. It was in the pantry and was just about expired. It was fine. It made the whole dinner, thrown together as it was, seem like a "real meal." When my semester is over in ten days, I am planning to make no-knead bread, and fruit chutney, and Christmas cookies, and maybe a white fruitcake with pistachios and MIddle Eastern dried fruits, flavored with orange flower water. Alison, don't hold me to all these! By the way, Jane dear, a little bird told me you're lurking. Post a comment and say hello! If you and yours try the no-knead bread, it would be a hoot to find out how it went.